Nick Ingman's known to some for his groovy guitar instrumentals of the 60s – but here, he's at the top of the sound library game – serving up bigger group instrumentals in two different styles! Side one features "distinctive themes" – and has Ingman working a big band through modes that start with a romping Basie soulful style, then move into more electrified 70s modes – a bit soundtracky, but with some nice touches! 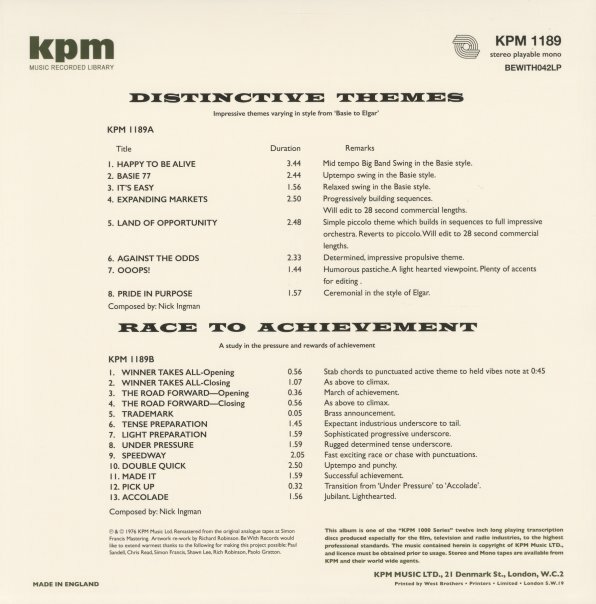 Side two features "race to achievement" – a series of short tracks that work very well as TV show themes – some offered in two versions, and all of them nice and brief, but with plenty of action in the mix! Titles include "Ooops", "Against The Odds", "Land Of Opportunity", "It's Easy", "Expanding Markets", "Made It", "Speedway", "Under Pressure", and "Light Preparation". © 1996-2019, Dusty Groove, Inc.